Ask Tom Dalzell about what to check out in Berkeley and you may never hear the end of it. Some five years ago, following a near-fatal hospitalization, Dalzell began a quest to walk every block of every street in Berkeley as a "methodical flaneur," sauntering through the city without an agenda. 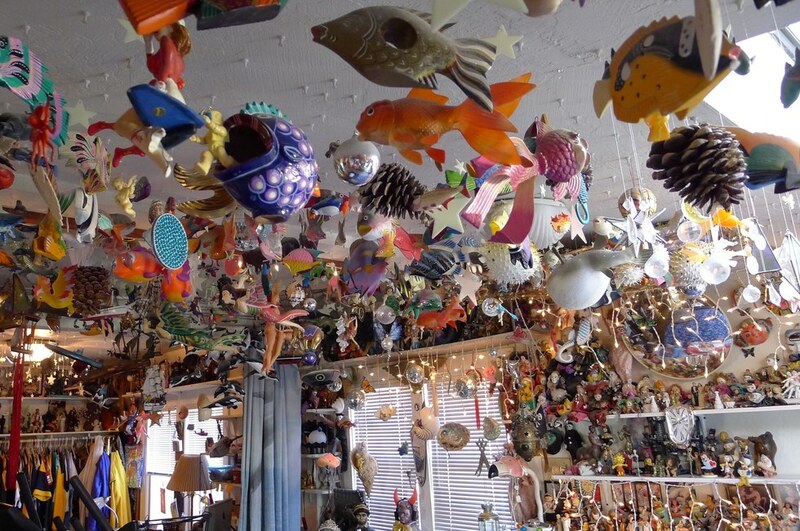 Soon, he would develop a purpose, cataloguing the endless stream of "quirky" finds — artifacts, artwork, constructions — from his walks for a blog, "Quirky Berkeley," and eventually a book of the same name. The labor-law activist, author, and slang-language expert (the structural sameness of the words "quirky Berkeley" is, in linguistic terms, called a "reduplication," Dalzell notes) has a seemingly encyclopedic knowledge of Berkeley's unusual culture. His blog is updated regularly, and virtually every post features the local artists behind the discoveries and a rich historical context to boot. The Quirky Berkeley book, published last summer, is a heavily consolidated version of the blog, and is slated for a second volume next year. We talk to Dalzell about his wanderings and what he envisions for the future of the city's quirk. 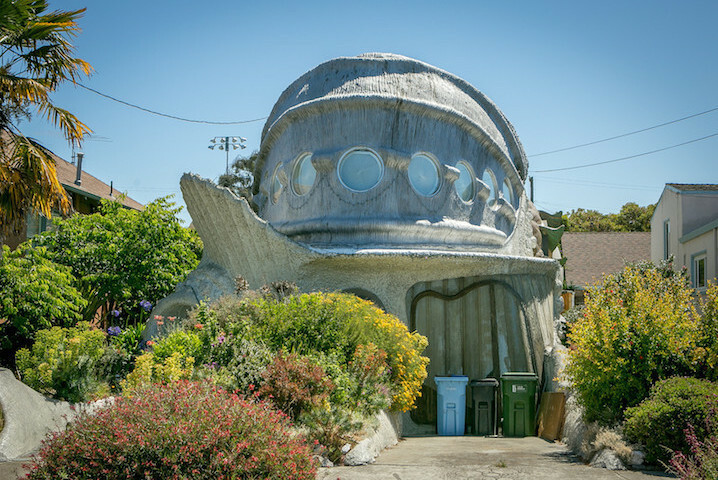 Dalzell refers to architect Eugene Tssui's fish house (though actually modeled after a tardigrade) at 2747 Matthews Street as the most bizarre find among Berkeley's infinite quirks. Tssui's parents lived in the fully-functional house for nearly twenty years. 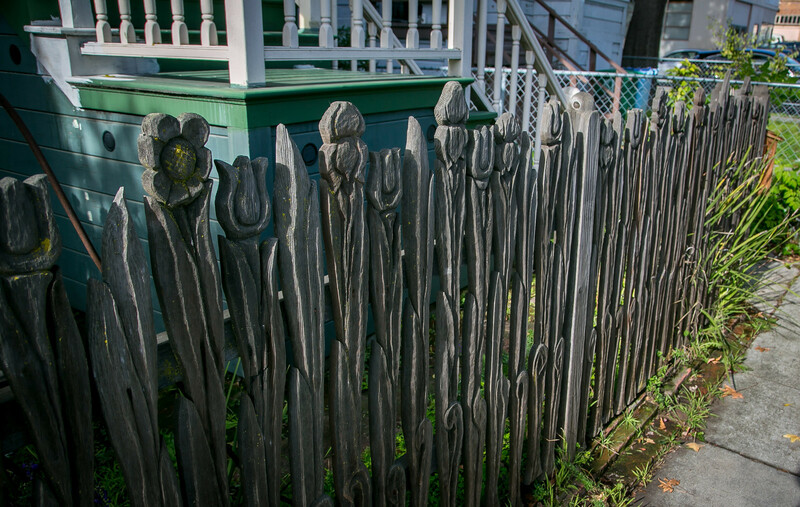 Sheri Tharp's beautiful hand-carved, redwood picket fence, across the street from The Starry Plough pub on Shattuck Avenue. Buldan Seka's ceramic sculptures at 707 Spruce Street are among the most memorable of Dalzell's discoveries. 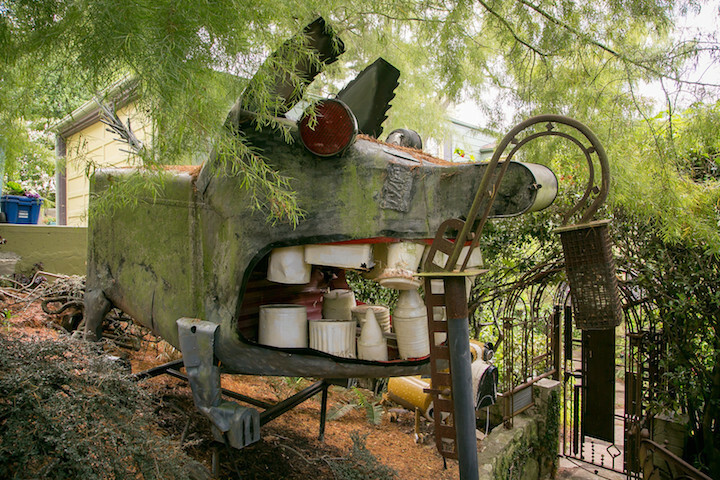 A giant wolf construction made by Patrick Amiot, residing in a yard on Vassar Avenue. 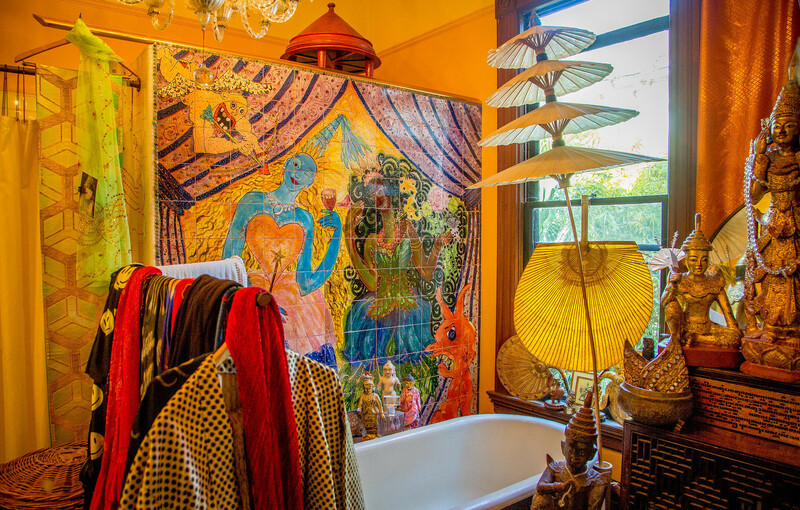 Dalzell will occasionally break his own rules and feature quirky finds within Berkeley homes. 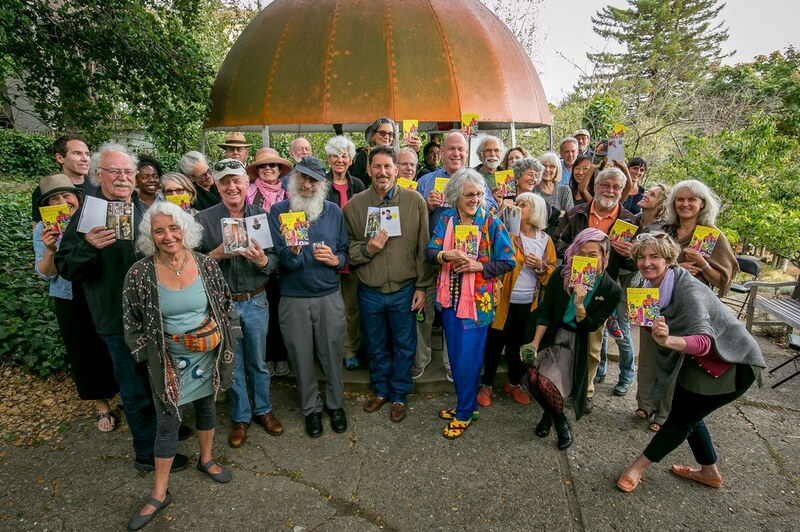 Dalzell and the artists featured in the book, Quirky Berkeley, at Bruce Dodd's giant orange. 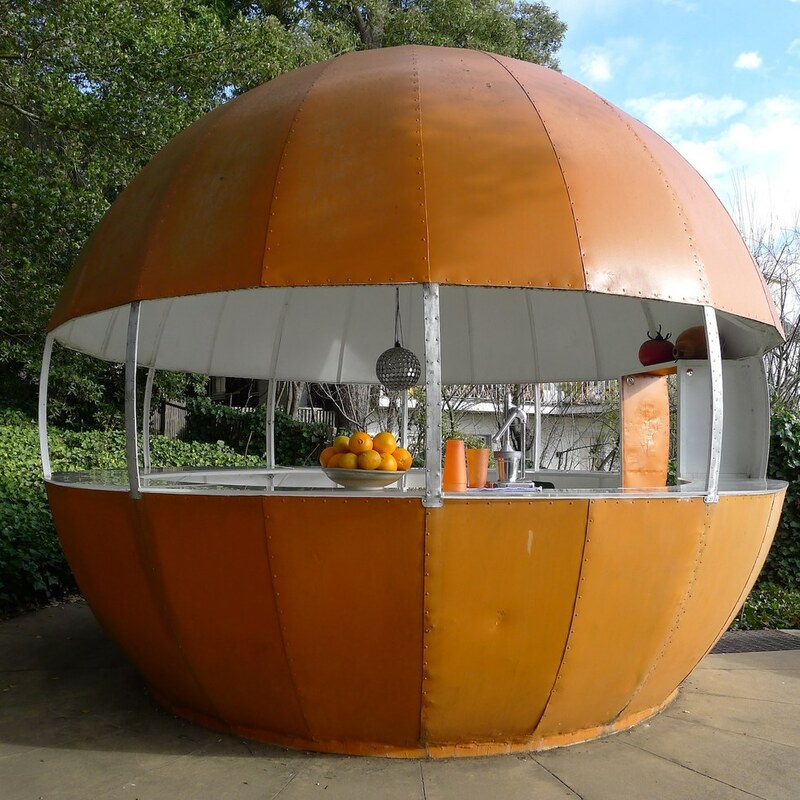 Dalzell's all-time favorite quirky discovery, Bruce Dodd's giant orange on 722 Spruce Street. The construction reminds Dalzell fondly of "old, weird America." 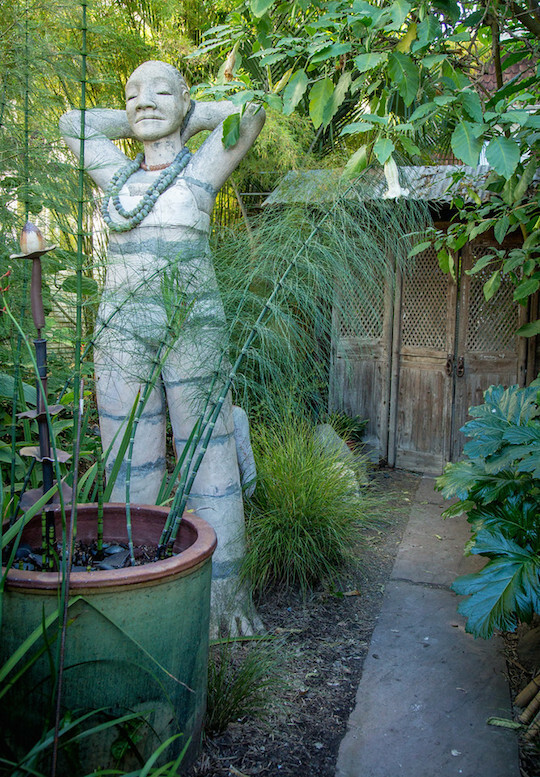 Marcia Donahue's sculpture, "Big Beauty," in her lush garden at 3017 Wheeler Street, open to the public on Sunday afternoons. How much cataloguing has gone into this project? There are 500 posts, some of which are digressions that have nothing to do with Berkeley. I think I am at somewhere close to 10,000 photographs, not all of which I have published. It can be as small as walking by a house on Walnut Street and seeing some brightly painted ceramic chickens that weren't there before, to the one of the bigger discoveries. I really can't say how many artists or collectors or just presenters. Are there rules for what you will feature? Yes, which I ignore at will. I try to focus on things that are visible from the street. But I'll go inside, too. I won't ignore a great "something" inside a house. Are there certain categories or types of quirky things that you find the most often? I've found a lot of quirky mailboxes. I've found a lot of peace icons. I've found enough bowling balls to do a post on that. I also did a post on unofficial little libraries. But certainly I'd say Berkeley is the peace icon capital of the world. How many miles have you walked so far for this project? Probably 200 miles of walking. I think I've narrowed it down to around 10 walks. And that's not having done the UC Berkeley campus. I haven't really decided what I'm going to do about the campus. So I'd say that I'm almost done. And I will freely admit that I was almost done at the end of 2015. I think there's a part of me that doesn't want to finish. So I've been very slow to do my last 10 walks. What are a couple of your favorite quirky finds? 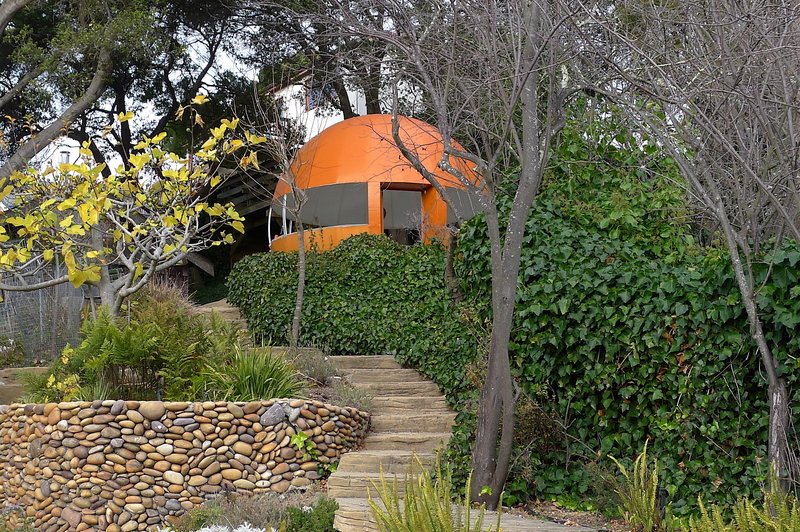 My all-time favorite is Bruce Dodd's giant orange at 722 Spruce Street. Greil Marcus is a cultural writer in Berkeley, and he coined the phrase "old, weird America," which I just love. And in old weird America, driving up and down Highway 99, there were orange juice stands in one-off, giant oranges. So the family would go for a ride without air conditioning in the car, pull over and buy some orange juice on shaved ice, and sit in the shade and just cool off. This is not "Orange Julius," these are one-off places, and they have slowly disappeared. They are an example of roadside, vernacular architecture—you know, giant hot dogs or giant hats or things like that. They've slowly disappeared, and Bruce Dodd in the late 1990s rescued this giant orange from Chowchilla, California. And I love it the most because it speaks to a California that's gone. Old, weird California. Old, weird America. Across the street on Spruce are giant ceramic sculptures by a woman named Buldan Seka. She is of Turkish descent and grew up in Macedonia. She fled to Istanbul when the Nazis invaded Macedonia, came to the United States in 1960 and started studying ceramics at the California College of Arts and Crafts with Viola Frey, who is the matriarch of modern ceramics. 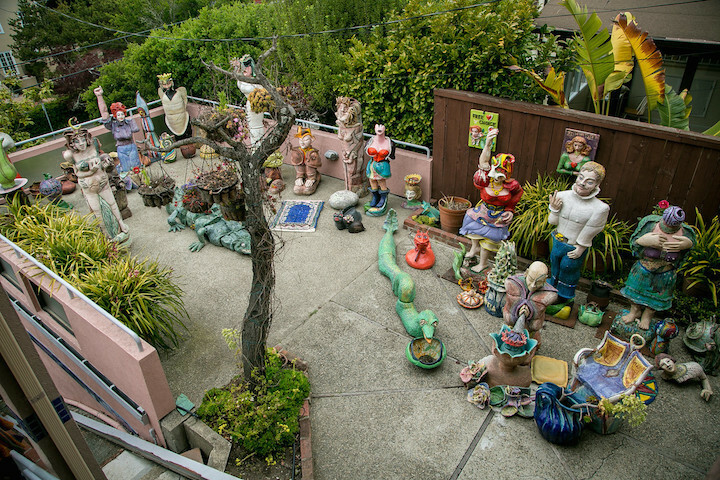 Buldan is well below five feet—a tiny woman, firecracker of a woman, who makes these incredible, grotesque (in the best sense of the word) eight-foot ceramic sculptures that she displays in front of her house. I don't think she's interested in selling. She's just showing her art. Some are half-chicken, half man—they are just quirky to the core. What about the most bizarre piece you've come across? The fish house on Matthews Street. Eugene Tsui is the architect. It's on a block full of California bungalows in a fairly conservative, largely African-American working class lot. 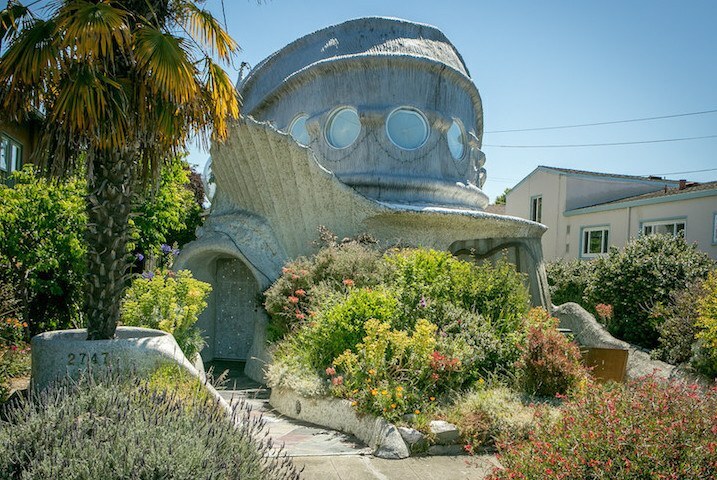 Here's this giant house with fins and eyes. 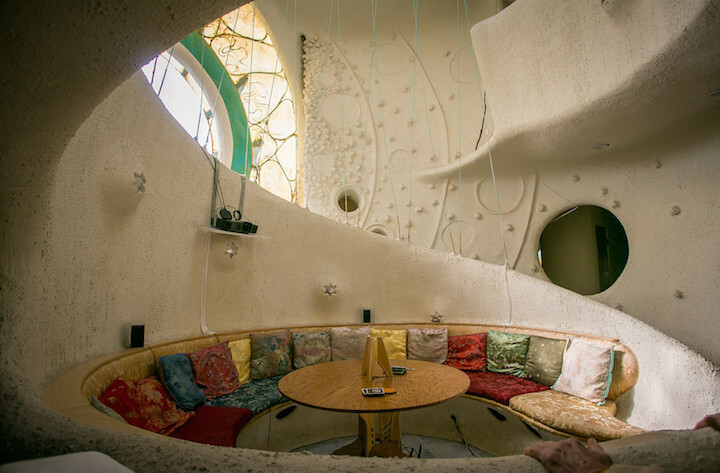 When you see it, you'll know it's the quirkiest piece of architecture in Berkeley, bar none. Do you have a favorite stretch of quirkiness in Berkeley? In a different sense of quirky, I do have a favorite commercial lot on Claremont Avenue where Star Market is. There's also a four-block stretch on Shattuck Avenue. It encompasses some of the great murals of Berkeley at the Starry Plough and La Pena Cultural Center. There is an incredible, handcarved, redwood picket fence. There is a coffee shop that is called Jump'n Java that features a lot of Mark Bulwinkle screen art. There is a very cool nursery called the Dry Garden Nursery that also features a lot Mark Bulwinkle art. And on Emerson Street, two blocks to Wheeler, you will find Marcia Donahue's sculpture and garden, which is open to the public on Sundays. What do you think it is that makes Berkeley such a hub for artistic expression? Well, it's been that way for 100 years at least. One hundred years ago people were wearing togas and living in the open air and in houses that looked like Greek temples up in the hills. It's California, plus the university, plus a long tradition of individualism and creativity and expression. It gets manifested in different ways in different generations. And I wouldn't go so far as to say that it's getting endangered, but Berkeley is changing, and it's changing in a direction where there will probably be less of this. Speaking of changes, what do you envision for the future of the quirky in Berkeley? I think it will always be there. I also suspect that if I had done this 40 years ago, I might think that what I'm seeing today is pale and watered down and timid. I don't know. The people who made the quirk that I'm now celebrating came to Berkeley as young and struggling people who could afford to live here. And the young and struggling have a much harder time now than they did then. You mentioned in your "Best of Quirky 2016" post that Quirky Berkeley seemed to have a life of its own. Is there a sense of optimism still? Berkeley has reinvented itself many, many times. And it will continue to do so. It'll still be a place where quirk is allowed. 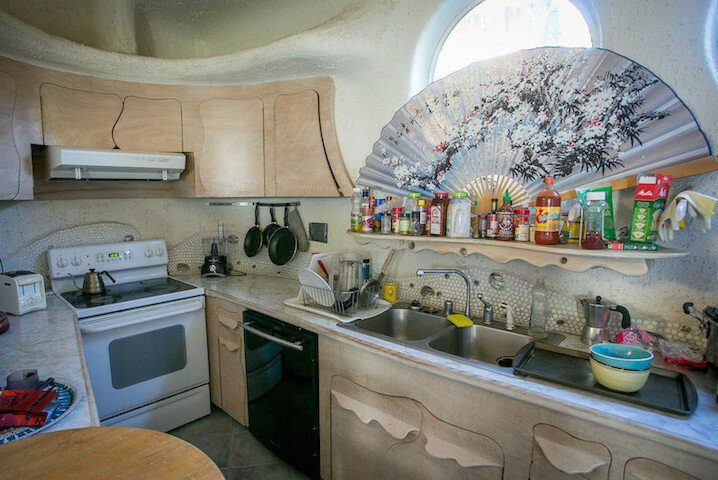 Do you see an end to Quirky Berkeley? Well, I am getting a lot of word-of-mouth tips. "Oh, did you know about this?" There are a number of major quirky things where I don't know the story, and I'll go knock on doors to find out more. I don't think I have the energy to start walking all over again. But I know that if I did, I'd see things that I either missed, or more likely, that are new. I haven't thought about the complete end of the line. I can't contemplate it, that's too sad. I think there will always be things to find and people putting things up.